Hi everyone, I am trying to truly create a pattern for the first time. I have altered/ modified patterns before to suit my tastes and that's been a useful learning tool, but now I am wanting to create from the ground up. - I know what I want the pattern to look like, I have drawn it out. The issue: I'm completely at a loss for how to execute this, I don't know how many stitches I need to have before starting the first flower, OR how to make sure the stitches in the in between row are lined up. I also don't know what it needs to be increased by every time. Basically, the numbers and the math of this is what's so hard. I am racking my brain. Is there a better way I could go about this? is there some sort of charting program people use to make sure stuff lines up? I attached my drawing. So both the flowers and the little chain 1 holes or spaces both create columns and the flowers increase by odd numbers and spaces increase by even. My issue is how to increase every row so that this works out. Thank you so so much, I am really thankful for any help. I don't know of a program to figure out the numbers for you. So a flower is made over 5 rows, is that right? and how many sts wide is a flower? Have you swatched the flower? Thank you so much for replying. I've swatched it several times, but I don't have my desired yarn/ weight with me so I can't get a real feel. I have to go to another yarn store because I don't have much access but I'm planning on swatching it tonight with a DK. I think the actual flower is just 4 sts. So 1 for the side ones, and 2 for the middle, so if I've counted right, which I may not have... it should be 4. Please let me know if I haven't been clear. I'm still trying to figure out if I know what I'm talking about, lol. I added this swatch to the original post. 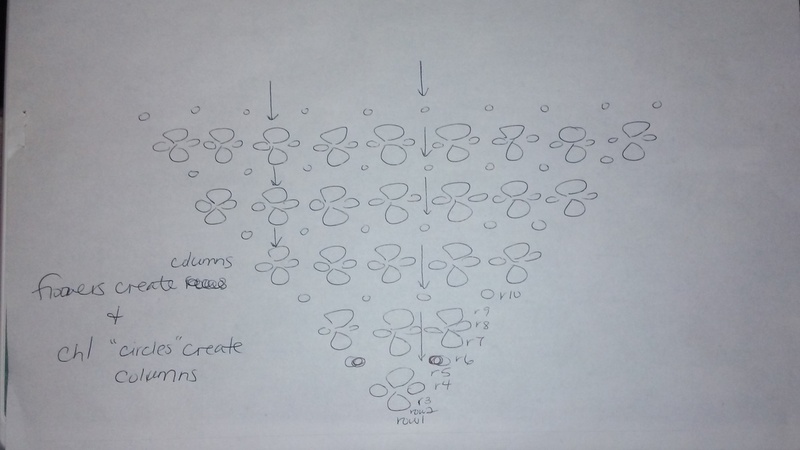 Obviously there are way to many increases, but the flower is made of 3 rows, not including the foundation row. the swatch helps a lot! I thought the flowers were solid on some openwork background. So basically you are doing a filet crochet approach where the visual pattern consists of the negative space created by the chain spaces. I think there may be some existing filet patterns that you can get ideas from. If you want I can look for some and link for you. 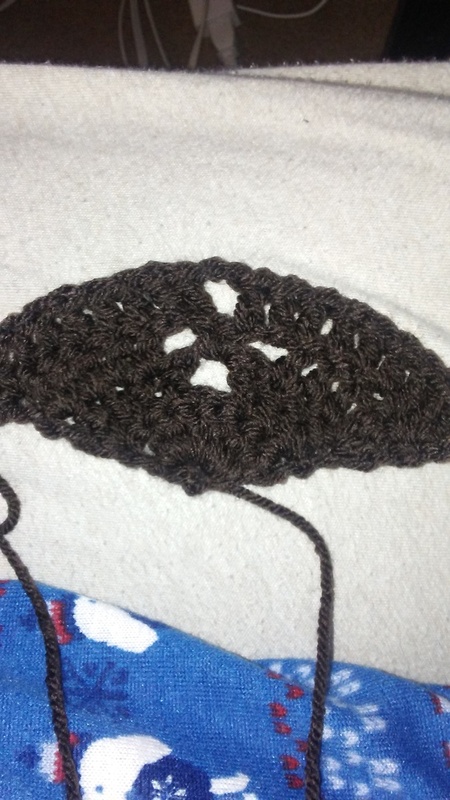 I have made one project that used a similar flower that I enjoyed making a lot and i thought turned out great http://virkstaden.blogspot.se/2015/08/en-langsjal.html as you can see it is not the same shape or angle of increase that you want but maybe you can diagram it out like she did in that pattern to figure the incs. i think you may need another solid row in between the flowers to add sts in. OMG how ironic and funny!! I just worked that one up the other night!! I really love it, keeping it and happy with it regardless. So you think I may need one MORE row, in between flowers, not just that one row that I have planned to give the chain1 spaces in, but another couple to just surround it all and add increases? I don't think I'm smart enough to tackle this right now. My husband's cheering me on but he doesn't know what all's involved haha!! SURE! if you happen to find anything similar, I would love to see it! I'm much better at taking something that's really close and adapting it , rather than starting from the bottom. this pattern is also SUPER similar in shape, it just doesn't have the same alignment: https://www.ravelry.com/patterns/library/clover-shawl-2 Or the spaces in the middle. I also prefer more flowers, ( I know you're thinking " but that one has a lot") but I worked up this pattern as well and it didn't come out how I thought. That looks good! I'd say you have a great start there. I came online to suggest looking at https://www.ravelry.com/patterns/library/balaton-shawl to see stitch counts and incs. But maybe now you don't need to. 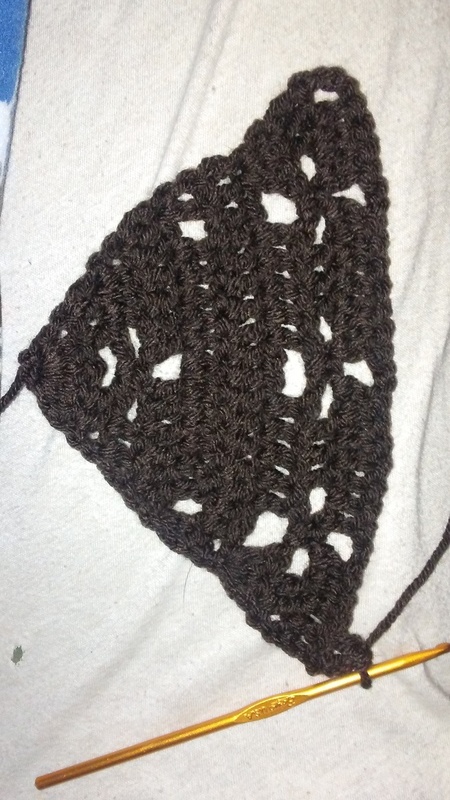 Magiccrochetfan has better pattern-searching-fu than I do, but I just wanted to point out that the clover shawl, even though I haven't looked at the pattern, is worked from the center 'top' down to the tip. See, it has a 'spine' down the middle? That's a giveaway that it's made by ever increasing triangles from the wide end, the spine is where increases are made to turn the corner at the tip of the triangle. It looks like 'you've got it' on the second swatch! I'm not a designer, but I wonder if you tried to chart it with paper and pencil before setting hook to yarn? Nothing fancy, just a line for the dc and a little circle for the chain ||°°|| . You should see a pattern forming after a few rows and you'd only repeat rows rows x thru y after the first few rows. If you chart it out...since you are stacking the flowers over each other, and the flowers are (I think) 2 skipped stitches...you could chart it from the middle out, so 1 edge of your chart would run thru the middle of the middle flower (so the center edge would be 1 chain every flower row). This should make it easier to plot it out and keep it symmetrical. Also, you may have edges on flower rows where you don't have room to make a flower, so you'd have to have a longer span of solid stitches on those rows, which would be OK (would look better than trying to make half a flower).